By Peter Hughes on February 3, 2019. Filed under: email. Your website is ready, and your business is thriving. All the effort you have put in your marketing is really showing in your statistics. You are getting a lot of traffic, and numbers are growing each day, which is great, but what you really need is for that traffic to pay off. Yet, your sales remain at the same status quo. There are many different tricks up your regular marketer’s sleeve to make this happen, but email marketing is proving to be the one with the highest ROI. A good newsletter could help immensely with the sales, and it is surely something you should focus on to get more people to buy what you offer. Unfortunately, to send them a newsletter, you need to get them to trust you enough to give you their email in the first place. And let’s admit it, you wouldn’t wish email spam to your worst enemy, so the bar is already set there a bit too high. So, in order for you to get the emails of people interested in you, you have to work a bit on your lead generation. This process of converting people can be extremely tough, as people are already super anxious about spam and scam, so the right way to do this is for it to be impeccable. If you start getting their emails, your newsletter has to be incredible as well, or you will be running on borrowed time before they hit unsubscribe. So how do you accomplish all that without going grey in the process? Well, if you are using MailOptin, you can rely on this plugin’s help with your lead generation and email automation to improve your credibility and get the most out of traffic. The first and one of the most important aspect is that the lite version of this plugin is free to download and use, no charges required. While it will not get you as many options as the premium version, if you are unsure of what you are doing, or just looking to give it a go, it will have you covered for basic forms for lead generation and email automation! If you are serious about it though, you can head on to the premium version. It will pay out in a very short time. To get people to leave you their email address, you have to be smart, but not over the top. You have to have them convinced they should do it, but not be pushy. If your copy is impeccable and clear, and your solution that you are selling really does the trick than you should be good to go. Still, there are always going to be a couple of doubting Thomases that need a bit of a push in the right direction. You can do so by sweetening the deal. You need to offer them something no-one would refuse. Free e-book, for example, is a good start, but anything else free that could make their life easier or bring them joy will also be a fair trade for their email address. Special discounts can also save your business in a number of ways on different occasions. To get them to know about this, you need an extraordinary form. Form building with MailOptin is super easy because you are basically using the good old and very familiar WordPress customizer. Use the knowledge of this customizer to create impeccable forms that will get people to sign up to your newsletter. You can add them as pop-ups for a surprise effect, or add them in the notification bar if you are feeling subtle. If you think one of your posts is having a good track record of converting people, then you should be putting your form right at the end of it. It can also be embedded or inline, depending on what your website needs. If you are not sure what your website, or more precisely your audience needs, you can use the plugin’s A/B split testing tools to find out. Marketing is all about testing and whether something works or not. By using these tools, you can get the guesswork out of the equation, and focus on the changes that have the greatest impact on your conversion rates. In order to do that, you can also rely on this plugin’s advanced analytics, which is luckily coupled with actionable reporting and insights. This is accomplished by integrating the Google Analytics, which will present you with detailed data about your efforts so that you can take actions which will improve your strategies in the future. If many visitors are “just looking” on your website, you might want to consider a strategy that will keep them from hitting the “x” or “back” button. 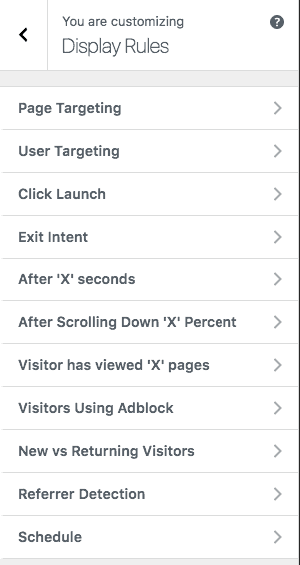 MailOptin’s exit intent technology will detect the exact moment a visitor is heading away from your site by getting ready to press the notorious buttons. At that point, it will display an exclusive offer with a targeted Opt-in form to change their mind about leaving. Use exit intent to turn it on or off. Yet, the biggest effort on your behalf is how to sneak the opt-in form without disturbing your customers. Leaving their email to you should be a smooth experience and not something out-of-place. Luckily, you can use the DisplayEffects, which will bring their attention to your form in the least intrusive way. You can choose from over 30 different animation effects to present your form. You can present the form when they are finished reading using the Scroll Trigger, or you can use Device Targeting, which will target your campaign based on the users’ device. It can also check for referrals, and display the form that is compatible with where the user came from, or you can reward your customers if they have spent a certain time on your website reading your content using Time on Site animation effect. Now that the email list is growing bigger, you should contemplate how you can get the most of out them. Now, creating a newsletter that does the trick should be a fairly easy task, yet it should be accomplished in a way that your recipients do not mark you as spam, send your email to trash, or even worse, hit the unsubscribe button. First of all, your emails should be remarkable visually. They have to capture your reader’s attention by providing important information, classy style and eye-pleasing visuals. This can all be accomplished with MailOptin as it contains intuitive and powerful email builder. You can use it to effortlessly create visually astonishing emails your customers would love to read. Yet, there is no “one size fits all” email template, and you should be able to target people and groups within your email list. With this plugin, you will be able to segment your list allowing you to send targeted campaigns. You can also make a distinction between user roles of your subscribers when sending them the emails. This would be a tremendous task if you had to do this manually, right? With this plugin, you don’t have to, luckily. You can set up automatic emails that will be sent daily, weekly, or even monthly, and keep your audience engaged, coming back to your website for new stuff or great deals, without you having to lift your finger. You can further restrict emails, based on categories and tasks you can create, and let the plugin do its job. This way, you will never send the right email to the wrong people, and can easily escape the “unsubscribe” curse. You can also get a bit more personal with your emails, by using the fact that you can send automated and even better, triggered emails. Someone just left you their email? Say hi! A purchase has been made? Let the buyer know that you appreciate it, and let them know of the status of their order. Last, but not least important feature is the fact that it is compatible and supports the integration with all the major and trusted email marketing providers. You can install it with no worries, and it will do what it does best, regardless of which email marketing provider you chose to help you out. To sum it up, if you are looking to get the most out of your visitors and increase your sales with email marketing, the MailOptin plugin can take a lot of worries off of your shoulders! From getting the email addresses in the first place, to keep them on your site and coming back for more, this plugin will take care of it.